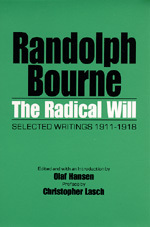 Randolph Bourne was only thirty-two when he died in 1918, but he left a legacy of astonishingly mature and incisive writings on politics, literature, and culture, which were of enormous influence in shaping the American intellectual climate of the 1920s and 1930s. This definitive collection, back in print at last, includes such noted essays as "The War and the Intellectuals," "The Fragment of the State," "The Development of Public Opinion," and "John Dewey's Philosophy." Bourne's critique of militarism and advocacy of cultural pluralism are enduring contributions to social and political thought, sure to have an equally strong impact in our own time. In their introduction and preface, Olaf Hansen and Christopher Lasch provide biographical and historical context for Bourne's work. Randolph Bourne (1886-1918) studied with Charles Beard and John Dewey at Columbia University. He was a regular contributor to The New Republic, Dial, and The Seven Arts, and active in the protest movement against American entry into the First World War. Olaf Hansen teaches American Studies at the Johann Wolfgang Goethe University in Frankfurt. Christopher Lasch is Professor of History at the University of Rochester.